It is not an action that we will pursue alone. Indeed, our British and French allies, and members of the Arab League, have already committed to take a leadership role in the enforcement of this resolution, just as they were instrumental in pursuing it. A rational individual reading this quote would assume that this would mean that the United States would be taking a backseat role in the military action in Libya. Welcome news to war-weary Americans who have lived the past ten years with Afghanistan and the past eight with Iraq. As trillions and trillions of dollars leave America for wars on the other side of the world—despite talk of government shutdowns and budget crises—the statement that the U.S. would not be leading these strikes was good news in a bleak financial environment. As a part of this effort, the United States will contribute our unique capabilities at the front end of the mission to protect Libyan civilians, and enable the enforcement of a no-fly zone that will be led by our international partners. US Defence Secretary Robert Gates today said that his country expects to hand over the leadership of the military operations against Libyan regime to a coalition likely to be headed by either the French, the British or NATO "in a matter of days". Wait, what? After two assurances from President Obama that the United States would not lead the military operations against Libya we are actually looking to hand over said leadership? And we do not even know to whom? So I decided to do a quick Google search of "us-led libya." Multiple outlets are referring to the strikes in Libya as "U.S.-led." The Atlantic says that Operation Odyssey Dawn could cost the allies between $400 million and $800 million. The outlet also uses the language of "U.S.-led" operations. Obama also threw out the phrase "international community" nine times in the two speeches, trying to link the U.S.-led actions as being backed by the world. Unfortunately, this is not the entire truth. Russian Prime Minister Vladimir Putin went so far as to say that the operations reminded him "of a medieval call for a crusade." China tempered their negative response, saying that the actions violated international law and damaged the UN Charter. Both countries abstained from the UN vote authorizing military action in the North African country. The Arab League, another group touted by Obama as being behind military action in Libya, has not been as supportive as the Obama administration has portrayed. The Secretary General of the League, Amr Moussa, called an emergency meeting to discuss the events. The New York Times characterized the Arab League's opinion of the air strikes as "extreme unhappiness." 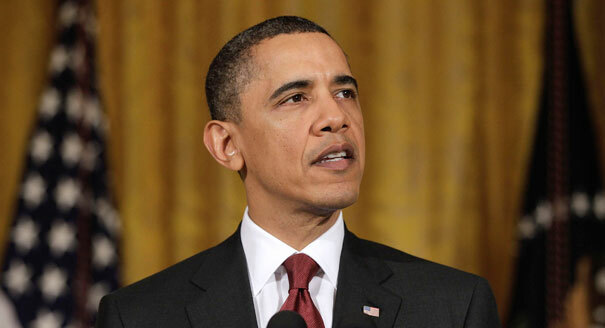 Barack Obama talks a big game and has rarely backed it up when it comes to foreign policy. Guantanamo is still open, Bradley Manning is essentially being tortured while Obama's press secretary touts the administration's "transparency," and now the U.S. is leading military action in a country that is not a direct threat to the United States. To make matters worse, a French official has echoed the words of Libyan dictator Moammar Qaddafi, saying Monday that the operations in Libya could last "a while." Obama's broken promises continue to pile up. The fact that he continually told the American people that the United States would not take a leading role in military action against Libya, while at the same time having the United States take the leading role in military action against Libya, shows just how empty his words have become. One promise that I hope Obama keeps is the one stating that American ground troops will not be deployed in Libya. Given his other promises regarding the country, however, I am not holding my breath. It seems like the initial strikes were successful, so that is further confirmation that the intial strikes were not French-led. Here's my premise: if, as Obama said, the United States is not going to take a leadership role, why is there now talk of "handing over" the operation. These two are inherent contradictions. The second quote says nothing about "leading" the front end of the ops, but "contributing." Let me throw out a quick example: I used to "contribute" to the Huffington Post. Never, at any time, did I get to name the Huffington Post (I would not have picked something as bad as Operation Odyssey Dawn) nor did I ever have to hand over the operations of the Huffington Post to someone else (because I never led HuffPo). In short, contributing and leading are two very different things and what the U.S. has been doing in Libya, at least up until now, is leading, not contributing. So why didn't Obama just say that America was "leading" the first part of the ops in Libya and not simply "contributing?" Because he had already said that the U.S. would not be leading the efforts in Libya, despite the very fact that we were. I got into a very similar conversation with someone over at Reddit. Both local and international media outlets are calling the Libyan ops U.S.-led, not U.S.-assisted. It is simply horrible politics to say that the U.S. will not lead military action at the very same time that the action is U.S.-led. Here's another issue that you bring up: if our airstrike capabilities are "uniquely awesome" (there are scores of civilians in AfPak who would tell you they're not as accurate as one would think, if they were alive) then what happens when the U.S. stops leading the charge? A French official has already admitted that the war in Libya will take "a while." I find it hard to believe that the U.S. will lead in the beginning, leave, and not be asked to assume some kind of leadership role, especially given our superior air power (as 9in67 points out, we're talking about the French). Honestly, if Obama's foreign policy were up to snuff at this point in his first term, I really would not be getting my knickers in a twist over this. However, he has proven horrendous when it comes to foreign policy promises. Guantanamo. Military tribunals. Bradley Manning. Afghan COIN. I mean, where does it end? Now we are taking military action in a country that is not a direct threat to the U.S.
Obama's words regarding foreign policy need to be put under the microscope. Unfortunately for him, and the American people, they do not hold up.